3/13/2009Share this story on Facebook! Janitor debuted on Xbox Live on October 27. The story is about a young student who is in detention when the school janitor goes on a bloody rampage. 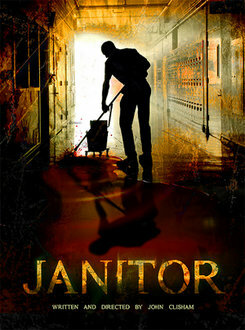 Clisham says Janitor pays homage to the style of 1980s slasher flicks. The cast includes Jenna Dewan, who played the lead role in the dance movie Step Up and had a supporting role in The Grudge 2. John Clisham ’03 is a self-proclaimed computer geek who graduated from Ithaca College with the dream of being a writer and film director. Clisham is living that dream today, watching his short horror film Janitor skyrocket in popularity to become the number one download on Xbox Live. Xbox Live is an online community for Microsoft’s Xbox 360 users that allows them to download purchased or promotional content such as games and movies. A cinema and photography major at IC, Clisham is finding that his love of horror has put him in the company of blockbuster horror film directors Leigh Whannell and James Wan of Saw and Andrew Douglas of The Amityville Horror remake. This group of directors is pioneering the first short films on Xbox Live. Director John Clisham working through an action sequence with Ted Rooney, the actor who played the janitor. Clisham’s fascination with horror movies goes back to his days as a young boy growing up in a small town in Maine. As an undergraduate, Clisham built a résumé for success by mixing and matching skills from his work and internship experiences, student film production, and writing classes. He worked on campus for Information Technology Services (ITS) as a technology instruc­tor, teaching faculty how to use web design and video editing soft­ware. 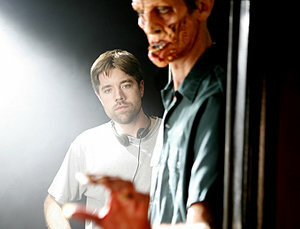 Clisham applied his technology skills from ITS and class film projects to get his foot in the door of the movie-making industry. He scored an internship at Lightstorm Entertainment, the Santa Monica production company of director James Cameron, through Ithaca College’s Los Angeles program in 2002. While interning for the Oscar-winning director, Clisham says his experience using the audio-video equipment accessible to students at the Park Portable Equipment Center proved to be a tremendous advantage. He helped shoot insert shots for the final episode of the television show Dark Angel and found his hands on experience from Ithaca really gave him an edge on his internship. Clisham continued working for ITS after graduation, producing video and photos for the Ithaca College website. He credits the job as being one of his first learning experiences in job interviewing and professionalism. Two years into that job he packed his bags for Santa Monica to work on Avatar, James Cameron’s new feature film (currently in production) at Lightstorm. He worked hard as a member of Cameron’s Sector 5, which Clisham describes as Cameron’s right-hand team of go-to guys for completing small tasks at the drop of a hat. It was during his work at Lightstorm that Clisham was discovered. Executives from Microsoft passing through his office noticed horror shorts that Clisham was producing for his website on nights and weekends. Microsoft was getting ready to test the idea of delivering films on Xbox Live, and the executives told Clisham to pitch his ideas to the company, which he did. 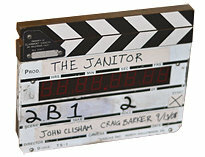 The horror clips paved the way to producing Janitor.